"The world's a dry place. It's the Lord's mercy that I can have fellowship with others every day so that, together, we can be supplied and encouraged to press onward in our Christian life." Please leave a comment regarding our website. 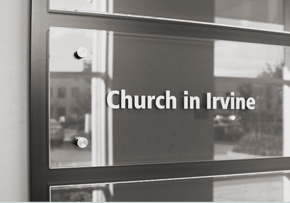 About | Our life | Belief | Gospel | Ministry | Members | Visit | Contact | Feedback Site Map | Privacy Notice © 2011 Church in Irvine. All rights reserved.